It’s a sad truth that fresh seasonal products can be expensive, and doubly so when those products are foraged. Take, for example, morel mushrooms and fiddlehead ferns. Both representative of Spring, both foraged, both expensive. But you don’t have to buy very many of them to make a big impact, and all you have to do is to treat them simply and bring out the best of their flavor. 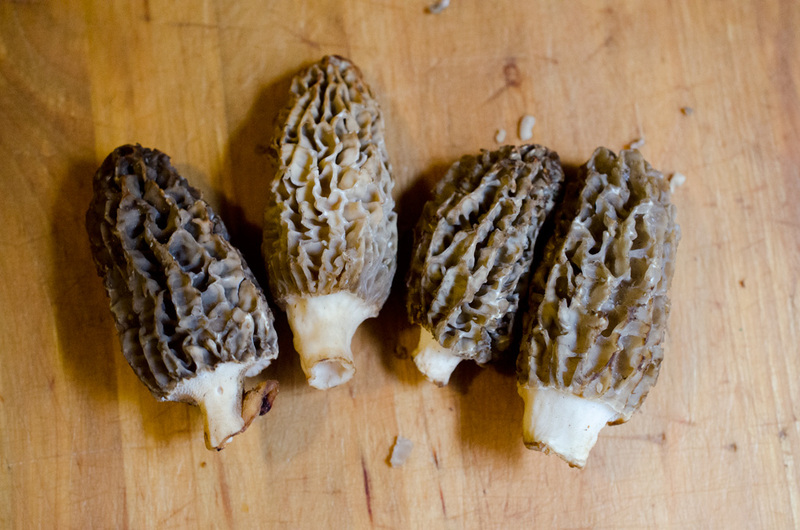 Start with the morels. Cut them in half lengthwise and make sure the interiors (which are hollow) are clean — brush out whatever you may find. Then cut them into strips, and begin cooking them in olive oil over high heat. 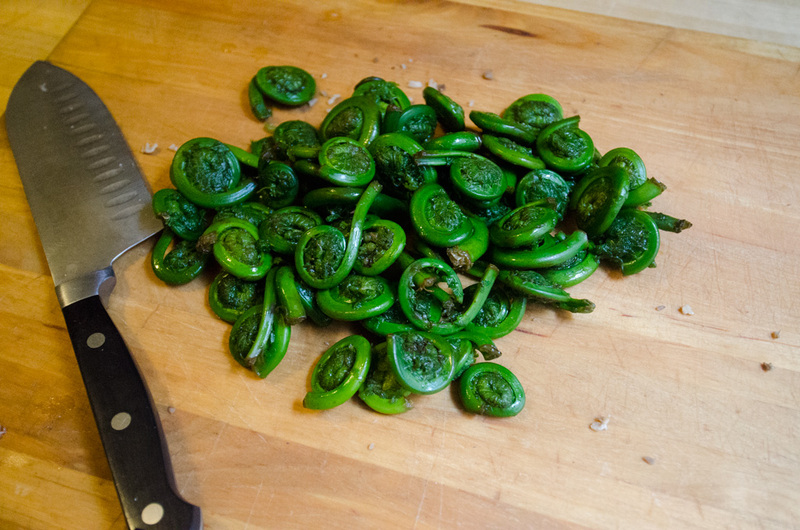 While those are cooking you can address the fiddlehead ferns. 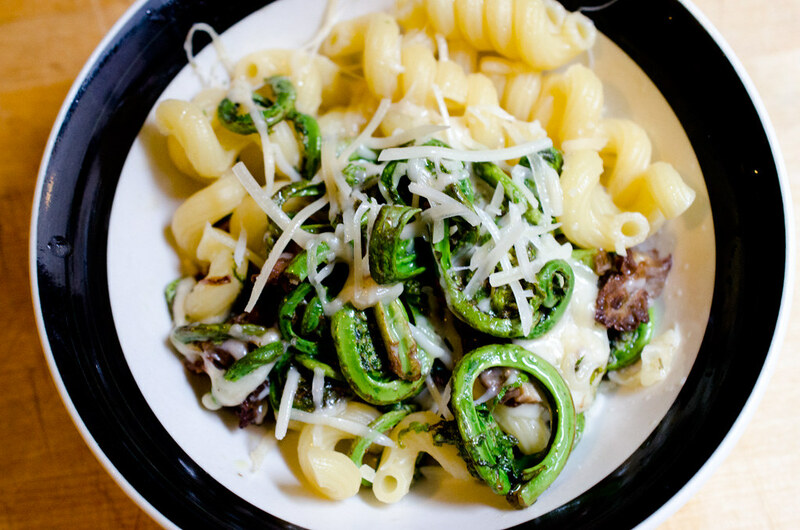 I’ve cooked with fiddleheads before, and I’d heard that you should always blanch the ferns before cooking them to remove a “muddy” taste. But I began to wonder what would happen if I didn’t blanch them first, if I just sauteed them in olive oil — and it works just fine. So rinse off the fiddleheads, and when the morels have started to brown add the ferns. Mix them all together and let them cook for a good while. Meanwhile you should have some pasta boiling in salted water. Add some salt to the pan with the mushrooms and ferns, and some water as well. Turn down the heat and let them simmer until the pasta is done. When the pasta is ready add it, as well as some of its cooking water, to the pan of mushrooms and ferns and cook it all together for a moment. Turn off the heat, drizzle with olive oil, and top with grated parmesan. Mushrooms get lots of different adjectives attached to them; morels are best described as meaty. I also detect a hint of cinnamon flavor in them, though I may be imagining that. Fiddleheads have something of an asparagus flavor, which works well for me now that I have developed my asparagus allergy. Taken together the dish is a representation of early spring flavors.